Vada's Blog Stamp Inks and Paper : Puzzle Layers from October/November 2010, Technique Junkies Newsletter. Puzzle Layers from October/November 2010, Technique Junkies Newsletter. I needed a quick card for Barb and when I saw this technique and came across this graphic, I knew it was perfect for Barb’s anniversary card.She bakes for a local bakery in town, needless to say “She Can Cook”. The graphic show’s a little girl, who is grading cheese, she has a wonderful tossed salad on the table along with a bottle of wine and a loaf of bread. Now how fun is this? This is a graphic from Magic Moonlight. I only used one stamp from TAC on the background. What’s Cooking is a computer font.Thanks for stopping. That's a gorgeous card Vada!!! And it is perfect!!! 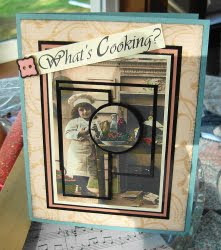 Vada, This is such a perfect image and card for a baker! 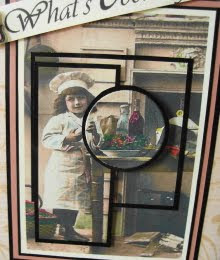 Love how you put this puzzle together to create a stunning card! Brilliant! Love the pictures of the doggie saying, "Hello" to all who visit you! Very cute! This is such a wonderful card, know that Barb will absolutely love it. Thanks for sharing. Fantastic card, Vada - I love this technique!